The year 1981 heralded the emergence of a new music festival in the city of Calicut in Kerala. 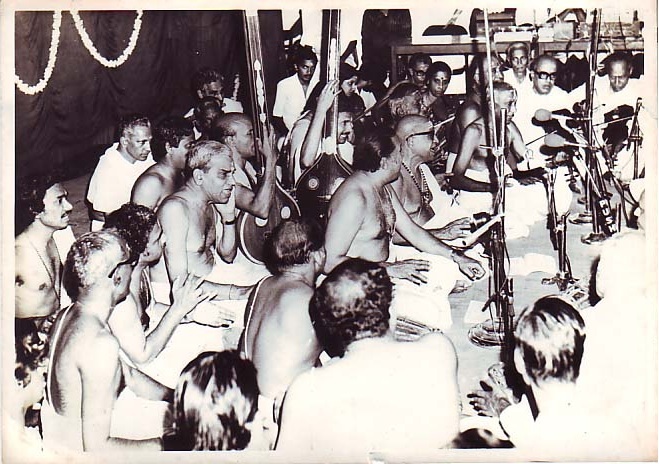 It was the year that a host of Carnatic music enthusiasts gave the impetus to start the Tyagaraja Aradhana, affectionately known as Tyagaraja Utsavam in Calicut. Prominent names in this effort include mridangam vidwan Sri Puducode Krishna Iyer, veena vidwan Sri Unnikrishnan, flute vidwan Sri G.S. Sreekrishnan, staff artistes of All India Radio, Calicut along with the President and Secretary of the Sathguru Sangeeth Sabha Dr C.R. Parasuraman, Dr A. Ramanathan and Sri M.D. Rajamani. All this, for an enlightened sabha of listeners in north Malabar. A divine music festival of this style and scale was the dream of every rasika in this art loving city of Calicut, be they a student of music, performer, percussionist or simply a committed listener. This feast of Carnatic music has now come to be known locally and celebrated as Tyagaraja Utsavam. It is undoubtedly an important event in the city calendar, perhaps even country-wide, as artistes from all over India continue to grace the occasion with their performances. The festival takes place around the Pushya Bahula Panchami dates which fall around January-February commemorating the date that Tyagaraja attained mukti. The events are conducted in our premises at Padamashree in Calicut. The three day event in the initial years has now grown into a full-fledged five day festival. The festival provides the platform for music students and sangeeta rasikas to pay homage to great Sri Tyagaraja. The compositions of Sri Tyagaraja are performed non-stop from 8.00 in the morning up to 11.00 at night. Every year, approximately 500 devotees who pre-apply are able to perform on stage in these five days. The devotee can pick a Tyagaraja Kriti and can sing or play the kriti on an instrument to the accompaniment of a mridangam and a violin that the Aradhana Trust provides. The early afternoon to late evenings consist of concerts of artistes invited to perform. The festival of course cannot be complete without the ritual early morning Unchavriti, Nadaswaram performance, mass rendering of the Pancharatna Kritis in the mid-morning and the final Anjaneyotsavam into the early hours of the night. We are indebted to All India Radio, the Directors and the staff artistes of AIR Calicut for their support to us year on year. AIR relays all the late evening concerts from 9.30 pm to 11.00 pm. Live transmission of the Pancharatna Kritis on the Pushya bahula panchami day go a long way in promoting Carnatic music through wider coverage. Needless to say, the devotees’ music and the concerts attract crowds of young children, school and college students, office goers, home makers, elders in the households, rasikas from neighbouring districts, music teachers and performers from both Kerala and various states from all over the country and sometimes abroad. This was exemplified with the French musician Isabelle Clinquart who performed at our dais. She lived in Kerala for ten years and learnt carnatic music, and later went on to publish a book on South Indian music in French. And thus, the Tyagaraja Utsavam brings a community together.